Two young witches of today face of in this battle of magic. Who's spell will win? The Decorating committee had gone home to get ready for the dance, all that was left in the room was Sabrina who was trying to re-enforce the supports of the massive disco ball. She had the nail gun ready, and just before she shot there was a loud knock on the door. Sabrina miss-fired and the disco-ball fell to the ground with a resounding crash. Sabrina could have died of mortification, what would her fellow classmates think of this? There was only one thing to do, get rid of the evidence. “Make these things go far not near,” Sabrina whispered “Take these things away from hear.” Sabrina pointed her finger at the broken Disco-ball on the floor. Her spell hit the side of the disco-ball, bounced off and hit her, she fell backwards off the latter, and disappeared into oblivion. Hermione was practicing her levitation charm on a candle holder for what seemed like the millionth time, she had of course learned it 5 years ago, when suddenly there was a loud pop, and Sabrina Spellman appeared in front of Hermione. This sudden appearance makes Hermione lose concentration, and she promptly drops the candle holder. Sabrina who had seen that Hermione was doing magic, and wanting her to know that she knew it too whispers “Make these things go far not near, take these things away from here.” the candle disappears. Hermione being the quick witted girl she is, adds up everything in her head. Ok, she somehow apparated inside of Hogwarts, she did not have to use a wand, I think what I have before me is an evil mage. I read about them, they are strong, but I think I can take her. Hermione flourishes her wand, and great gold sparks fly out of it. 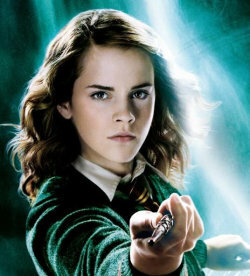 “If it’s a duel you want mage,“ Hermione cried “come and get it!” So who wins? A young witch who has a spell for every occasion, or the other young witch with an arsenal of spells at her disposal? Harvey: Wow, this is a first for Sabrina, she hardly ever gets into fights. Ron: Same with Hermione, except for that one time she punched Malfoy. Harvey: Ok, to the fight, Sabrina points her finger to a point above Hermione, and a small car appears. Ron: As the car starts to fall, Hermione points her wand up at it. Ron: Hermione uses the levitation spell to keep herself from being squished, and hurls the car at Sabrina. Harvey: Sabrina rolls out of the way, and avoids being hit by the car. Ron: Sabrina gets to her feet, and points her finger at Hermione. Sabrina: I’m in a fight, I’m in a squeeze, give this witch a repetitive sneeze. Harvey: Hermione immediately starts sneezing, and between “Achoos” Hermione points her wand at Sabrina. Ron: Hermione uses the tickling charm on Sabrina, and Sabrina doubles over in laughter. Harvey: The sneezing spell Sabrina cast on Hermione losses it’s effect with Hermione’s last spell. Ron: Sabrina is still laughing, and Hermione points her wand at Sabrina again. Harvey: Sabrina starts dancing a kind of quick-step all the while laughing uproariously. Ron: The combination of dancing and doubling over with laughter causes Sabrina to loose footing and fall over. Harvey: Sabrina hits her head on the ground, and is unconscious. This fight is over.